On the third weekend in May of each year, Mareeba Shire Council plays host to ‘The Great Wheelbarrow Race’. This is an event where competitors push an empty wheelbarrow along the ‘Wheelbarrow Way’ between Mareeba and Chillagoe over three days. One of the region’s most popular events is back for yet another year with the Great Wheelbarrow Race officially launched in Dimbulah on Saturday. The launch coincided with the naming of this year’s Face of the Race, with that title being awarded to Sandy Butler for his extensive work behind the scences in helping organise the event every year since its inception. Mr Butler said being named Face of the Race was a huge honour. “To be recognised for my efforts and involvement in the Great Wheelbarrow Race really means a lot,” he said. “The idea was initially about helping the Tablelands and outback communities, and to see how much it has grown over the years is really pleasing to see.” Mr Butler extended his thanks to those who have played an integral role in the event’s success over its 16 year existence. “Firstly I would like to thank Mareeba Shire Council for taking this event on board each year and supporting it – they do a brilliant job,” he said. 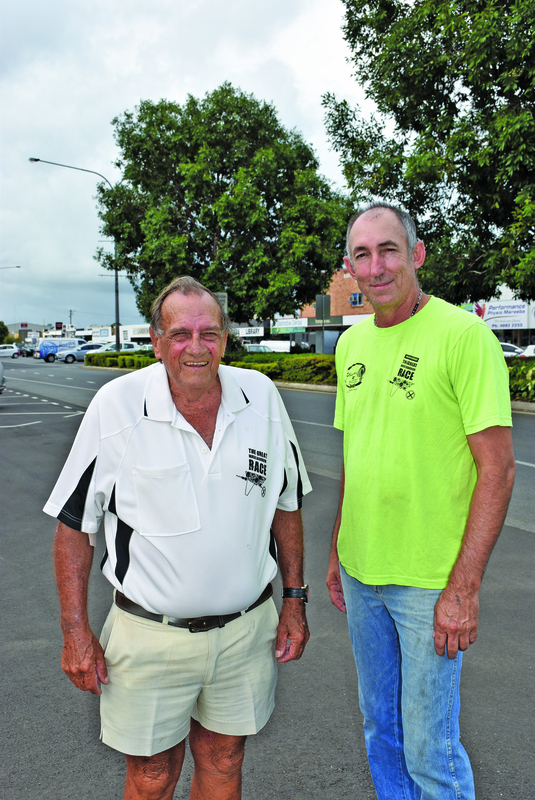 “And in particular I also want to recognise Mick Borzi, he started the Great Wheelbarrow Race and it wouldn’t be here without him.” Mareeba Shire Councillor Nipper Brown spoke glowingly about Mr Butler’s commitment to the continued success of the Great Wheelbarrow Race. “Sandy has been working behind the scenes every year and we thought this would be a great way to honour him,” he said. “Preparations are going really well for this year’s race thus far, and Sandy is once again a big reason for that.” Cr Brown alluded to the numerous economic benefits the annual race provides, and was quick to heap praise on those who lend a hand to support the initiative each year. “For some of the smaller towns along the race, this event provides them with one of their biggest nights of the year,” he said. “And none of that can happen without the Mareeba Shire Council and the generous sponsors who come on board each year to finance it.” This year’s Great Wheelbarrow Race will take place on May 17-19. The event will kick off in Mareeba with a parade down Byrnes Street, with the official start to be on Vaughan Street. This year will see the addition of a trio category, to go along with the usual solo, duo and team categories. In addition to race sponsorship opportunites, new this year is the chance for businesses to sponsor a category, with those interested asked to contact Natasha Srhoj on 0401 344 899. With only 12 spots available for category sponsorships, it’s a great chance for local businesses to be a part of the storied race. Nominations open on February 1, 2019 and will be available on the race website – www.greatwheelbarrowrace.com. Regular updates will also be posted on the Facebook page ahead of the May event.